The hype surrounding the smart grid has resulted in smart meters being equated with the smart grid. Smart meters can improve certain aspects of the distribution system, and can play a very limited role in efficiently managing the grid, but they do not comprise the major components of, what is referred to as the smart grid. The mystique surrounding the smart grid is being used to entice the public into supporting expensive modifications to the grid, many of which are unnecessary except for integrating intermittent, unreliable renewables. First, let’s understand smart meters and why they may be useful when properly applied. Smart meters can indicate when there has been a power failure by transmitting a “last gasp” going-out-of-service message to the utility. This speeds repairs to the distribution system and saves the utility money. If there have been widespread power interruptions, such as after an ice storm, it allows the utility to manage repairs more efficiently. Smart meters can help maintain voltage levels on the distribution system. They can also make it less costly to cut, restore or establish service when people move or allow their payments to lapse. There is also an opportunity for smart meters to provide demand response. Demand response (DR) allows the utility to reduce loads during peak periods. DR has long been used by utilities, where manufacturers and large commercial establishments agree to shed load during peak periods. A store, for example, could cut half its lighting during such a period without seriously affecting operations. DR, however, can be a major threat to homeowners if it isn’t implemented with the homeowner’s permission. A smart meter can control thermostats and appliances if they are connected to the meter. Since air-conditioning is a major summertime load, contributing to peak loads, it would be possible for the utility to shut off the air-conditioning unit, by raising the thermostat setting 5 or 6 degrees, which would reduce demand for electricity. It could, if connected to a specially equipped refrigerator, turn off the compressor for short intervals to reduce demand. If thousands of homes are included in a DR system, the utility can shave significant load. All of this is fine, as long as the homeowner agrees in advance. The homeowner needs to be given the option, for example, of retaining low temperature settings on his thermostat, rather than enduring higher temperatures in the summer. The smart meter can also implement a time-of-day pricing schedule (Dynamic Pricing) if approved by regulators, assuming homeowners are given an opportunity to agree in advance to its usage. Time-of-day pricing really won’t accomplish very much, even though proponents of smart meters hype the concept2. Most people won’t do their laundry at night, for example, to save a few cents on their electric bill. Using the dishwasher and cleaning the oven at night are about the only real savings that homeowners will achieve from time-of-day pricing, and they are minimal. Installing a programmable thermostat, under the control of the homeowner, can achieve much larger savings. The reason for requiring homeowner approval before allowing utilities to control thermostats is that the government could require utilities to set thermostats higher in the summer and lower in the winter in an effort to save energy and cut CO2 emissions. This was proposed in California and abandoned when there was public outcry. 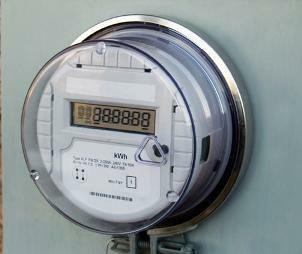 Smart meters may be able to save utilities money and improve reliability by reducing outages. They should not be used as a social engineering program to force people to use less electricity. It appears as though people don’t see the benefit of time-of-day (Dynamic) pricing. In the case of OG&E, where smart meters have been successfully installed, only about 5% of customers have opted for time-of-day pricing, though the utility expects this to increase. The municipal utility, SRP, serving Phoenix, has established a price of approximately 21 cents /kWh for peak periods, and approximately 6.5 cents /kWh for off-peak hours. SRP has had this plan, or similar plans, in effect since 1980, but only 22% of their residential customers have elected to be on the plan. Smart meters have advantages that may be worth pursuing, but the advantages are independent of the hype surrounding the smart grid. Smart meters have no relationship with expensive grid modifications needed for renewables, such as to accommodate wind and solar. The so-called smart grid is different from smart meters, and consists, to a large extent, of hype promoting renewables that increase the cost of electricity. If it costs $500 to install a meter, which seems to be the case at OG&E, it could take as long as 18 years to recover the cost with savings from meter reading alone (assuming the cost of a meter reader is $50,000 per year). This is not a satisfactory return on investment, and whether smart meters make economic sense depends on whether service and reliability and other costs are significantly improved. One of the reasons given by proponents of EVs and PHEVs for supporting smart meters and time-of-day pricing has been the assumption that EVs and PHEVs will need time-of-day pricing to reduce the cost of charging batteries and to ensure that batteries are charged during off-peak hours. The small numbers of EVs and PHEVs aren’t sufficient to justify the installation of smart meters. Please forward this message to those who might be interested in these articles on energy issues. Customers don’t need a fancy online system and immediate monitoring to figure out how to use less or use at different times OR how much energy certain appliances use. Smart meters are for the convenience and control of utilities, nothing more. Also for the profit, since all that data will be very useful to advertisers. But the worst thing from the actual consumer end is the health risks. People are getting sick from the pulsed radiofrequency radiation. It is involuntary and forced in many cases. America is supposed to be a place of free opinion and property control. Forced smart meters is un-American.